It’s not often that I’d take a whole post to publicise something, but I happen to know that a lot of you are going to be in London tomorrow (Sunday 7th Dec) and I really don’t want you to miss this! 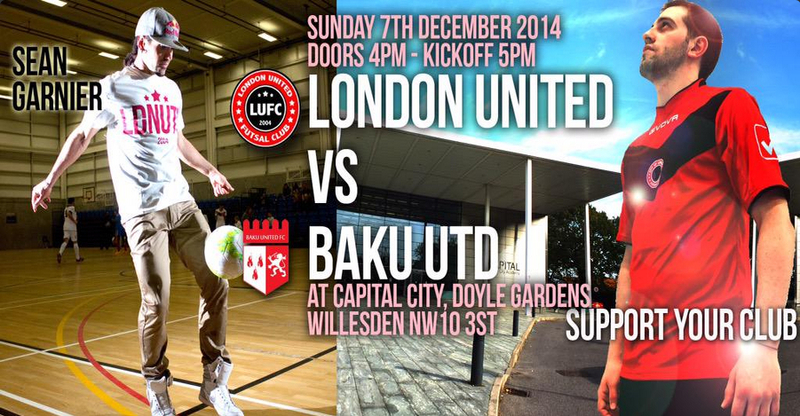 Yep, that’s it, tomorrow at 5pm London United Futsal are going to be joining forces with world champion freestlyer and ex-pro Sean Garnier for a game of Futsal. If you know anything about Sean, or have seen any of his insane videos (you might know him as the old man, we posted about earlier this year) then you don’t want to miss this magician in person! Don’t tell me you haven’t heard of Baku!? They’re only the most successful UK Futsal team, and full of fantastic players. Of all the teams Sean could have picked for his first game, that’s probably the toughest one he could have picked. That should add a bit of heat to it! Yes, get down to the game, doors open at 4pm to see this event. I’m going to be there, and I’m hoping to get some time with Sean afterwards for an interview! And if you can’t get there? Weep. Weep long and hard. Or, alternatively watch this video of Sean as a close second-best.